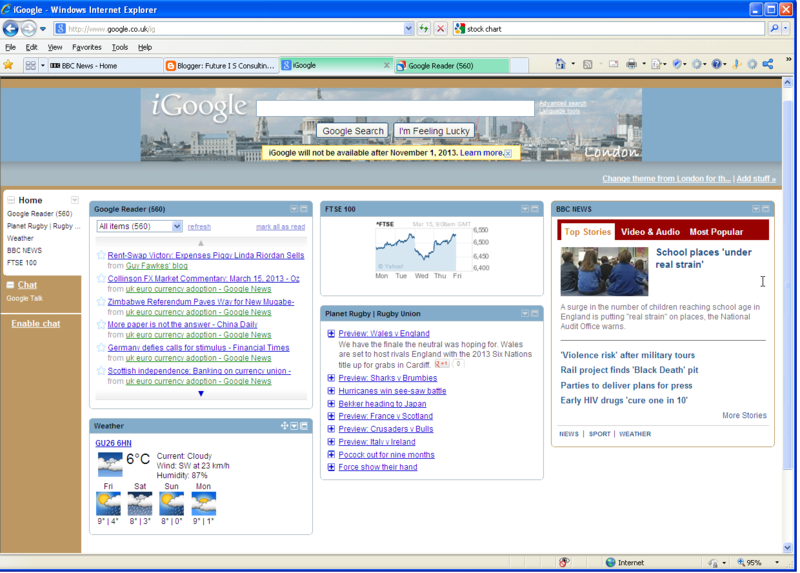 Google announced some months ago that its iGoogle service, which gives a customisable home page, will end on 01 November 2013. As a convenient place to start browsing, iGoogle is hard to beat. It lets you configure a wide range of widgets that link to data sources such as Google Reader (its RSS aggregation service), individual sites' news feeds, and a whole lot more. I've also used iGoogle dashboard widgets for webmaster tools to help manage various web sites, but these seem to have been withdrawn - without notice so far as I know. The tools themselves can still be accessed directly through the webmaster tools home page. Now there's the announcement that Google Reader itself will be retired on 01 July 2013. Yes, there are other aggregators such as the excellent Pulse app that runs on the iPad, but the search is now on for replacements for these two Google products that have served so well and looked just as good on PC, Mac and iPad. My worry is what could happen to other Google products such as Blogger, currently the platform for all of my different blogs. Could that be heading off into the sunset soon as well?